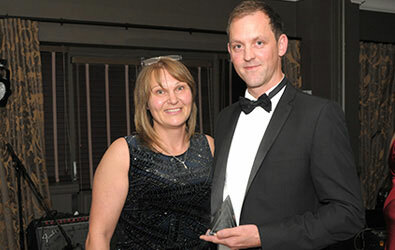 "Paul scoops award after attaining highest grades in the country"
"Fantastic news, Paul. You have the highest qualification available to the funeral profession, of which you are one of only a handful of people in the whole country who have obtained this prestigious award," said David Parslow, National Tutor at the British Institute Funeral Directors. At Paul Shoobridge Funerals Exeter, we are happy to announce the news of Paul being awarded the gold standard professional qualification, which was handed to him by the British Institute of Funeral Directors. As well as the qualification he received, Paul was awarded the Ashes into Glass Award to congratulate him on the highest scoring results. The BIFD Annual General Meeting and Awards Ceremony on Saturday 24th October 2015 saw Paul collect his award. 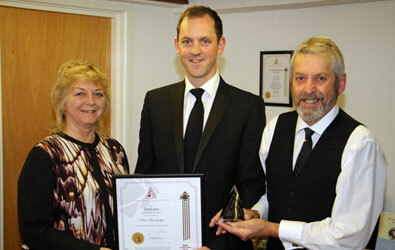 BIFD's National President, David Gresty commented "I am delighted to have presented Paul, not only with his Diploma in Funeral Service, but also the 'Ashes into Glass Award' for attaining the highest grades throughout the country. He is a credit to himself, the profession and our Institute." Our family firm are extremely proud of Paul's dedication to his studies, which saw him being awarded a Diploma in Funeral Service, as well as the 'Ashes into Glass Award'. He has proven himself within our profession as well as within our team. 'This is the industry's biggest individual honour, and we are all thrilled for Paul to have scooped this award for all of his work and efforts', stated Penny who is a funeral director within the firm. Shoobridge Funeral Services' Terry Shoobridge and Paul's father added "To say we are proud of Paul and his achievements would be the biggest understatement possible. That he combines determination, dedication and care towards our clients, Logistical expertise whilst maintaining his own, young family life is simply amazing. He is a credit to us, his parents and Shoobridge Funeral Services."